Quarterback Nick Bynkoski of the Acadia Axemen is the Atlantic University Sport football offensive player of the week for the week ending Oct. 11, 2015. A second-year kinetics student from Duncan, B.C., Bynkoski threw 19 completions on 23 attempts for 262 yards and four touchdowns in Friday night’s 47-9 Acadia victory over the Saint Mary’s Huskies in Halifax. He also ran for 51 yards on eight carries, including an eight-yard rushing touchdown. Defensive lineman Christian Plante of the Mount Allison Mounties is the Atlantic University Sport football defensive player of the week. A fifth-year commerce student from Dartmouth, N.S., Plante had 6.5 tackles (six solo and one assisted) in Mount Allison’s 27-17 defeat of the StFX X-Men Saturday in Antigonish, N.S. Among these were 3.5 tackles for a loss of 15 total yards, including 1.5 sacks for a loss of 11 yards. Plante was also credited with putting the Mounties on the board, recovering a fumble in the StFX end zone in the second quarter. Plante’s stats also included two carries for nine total yards on offence. Defensive back Suleiman Semalulu of the Acadia Axemen is the Atlantic University Sport football special teams player of the week. 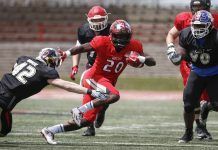 A fourth-year arts student from Gatineau, Que., Semalulu recovered a punt blocked by teammate Spencer da Costa and returned it 25 yards for a touchdown in the Axemen’s 47-9 defeat of Saint Mary’s Friday evening. Semalulu also posted a solo tackle on defence.